an ordinance that paves the way for its residents having access to faster and better broadband. So yesterday when we heard that AT&T was suing the City of Louisville for passing this so-called “One Touch Make Ready” rule, we were disappointed. 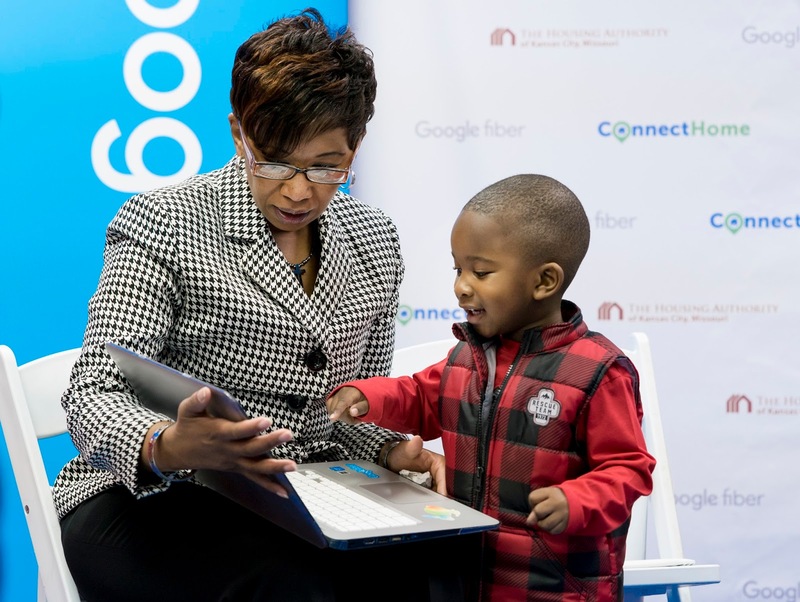 Google Fiber stands with the City of Louisville and the other cities across the country that are taking steps to bring faster, better broadband to their residents. Such policies reduce cost, disruption, and delay, by allowing the work needed to prepare a utility pole for new fiber to be attached in as little as a single visit—which means more safety for drivers and the neighborhood. This work would be done by a team of contractors the pole owner itself has approved, instead of having multiple crews from multiple companies working on the same pole over weeks or months. One Touch Make Ready facilitates new network deployment by anyone—and that's why groups representing communities and fiber builders support it, too. Google Fiber is disappointed that AT&T has gone to court in an effort to block Louisville's efforts to increase broadband and video competition. We are confident the City's common-sense initiative will be upheld. In response to the lawsuit yesterday, Louisville Mayor Greg Fischer was quoted as saying, "We will vigorously defend the lawsuit filed today by AT&T. Gigabit fiber is too important to our city's future." Mayor Fischer, we couldn’t agree with you more, and stand with you. We were heartened and encouraged when, a few weeks ago, the City of Louisville, Kentucky unanimously passed an ordinance that paves the way for its residents having access to faster and better broadband. So yesterday when we heard that AT&T was suing the City of Louisville for passing this so-called “One Touch Make Ready” rule, we were disappointed. to tap into the city’s planned municipal fiber network. And that’s why we’re trying something different in our latest Fiber city—San Francisco—where we’ll bring service to some apartments, condos, and affordable housing properties, using existing fiber. San Francisco has a long history of creativity, innovation, and development, with its iconic cultural centers, countless startups, and dozens of colleges and universities. In thinking about how best to bring Google Fiber to some residents in this unique city, we considered a number of factors, including the City’s rolling hills, miles of coastline, and historic neighborhoods. By using existing fiber to connect some apartments and condos, as we’ve done before, we can bring service to residents more quickly. This approach will allow us to serve a portion of San Francisco, complementing the City’s ongoing efforts to bring abundant, high-speed Internet to the City by the Bay. As part of our work in San Francisco, we also want to help residents get online for the first time. One of our leading initiatives will be connecting some public and affordable housing properties to gigabit speed Internet—for free. In partnership with the Nonprofit Technology Network (NTEN), we’re also bringing the Digital Inclusion Fellowship to San Francisco. NTEN is accepting applications from organizations to host fellows who will teach people to set up email accounts, apply for jobs, access content across the web, and more. Through these efforts, we hope to make the Internet more affordable and accessible for those most affected by the digital divide. We have a lot of work to do before we can offer details on service and timing, or identify the specific condos, apartments, and affordable housing properties that will be connected. In the meantime, residents and property owners interested in Google Fiber can sign up for updates on our website. San Francisco offers tremendous potential for gigabit Internet, and we hope Google Fiber will provide more fuel for this city’s pioneering residents and entrepreneurs. Nearly six years ago, we started Google Fiber with the goal of making the web better and faster for everyone. 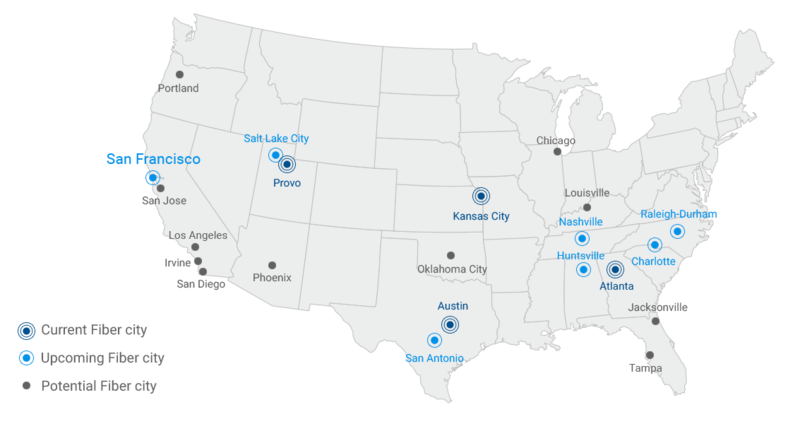 We began in Kansas City and have now committed to bring Fiber to a total of ten metropolitan areas. To date, we’ve focused mostly on building fiber-optic networks from scratch. Now, as Google Fiber grows, we’re looking for more ways to serve cities of different shapes and sizes. That’s why we’re working with Huntsville, AL to tap into the city’s planned municipal fiber network. And that’s why we’re trying something different in our latest Fiber city—San Francisco—where we’ll bring service to some apartments, condos, and affordable housing properties, using existing fiber. Huntsville will join 20 metros where we’re serving customers, designing and building networks, or exploring the possibility of Google Fiber. Now more than ever, cities are exploring new ways to help their communities flourish with fiber. Like any infrastructure, such as roads or electric grids, a fiber network is a long-term investment that can benefit a city for decades. In 2014, Huntsville’s leaders shared their vision for a community energized by superfast speeds — and they decided to build a network that could support an electrical smart grid and other municipal needs, plus provide the best of the Web for local families, entrepreneurs, businesses and academics alike. To help achieve this goal, the city asked to hear from fiber providers who might be interested in working together. So we got in touch. 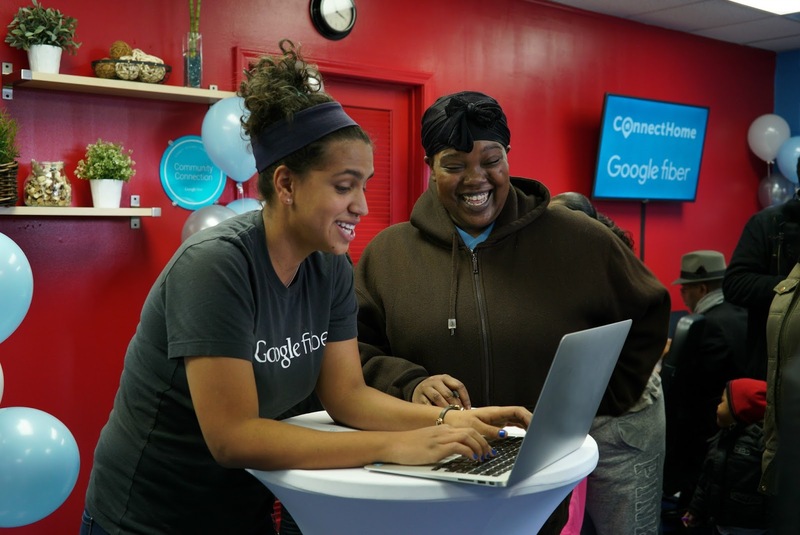 To date, we’ve built the majority of our Google Fiber networks from scratch. But over the past five years, we’ve repeatedly seen that every city is unique. So in order to bring Fiber to more people, we’ve taken different approaches in different places. In Provo, Utah, our Google Fiber service is being delivered over a network we purchased from the city. In Atlanta, Georgia, we’re both constructing our own network, and using existing fiber to provide Google Fiber to some apartment buildings. And now, due to the leadership of the Mayor and Huntsville Utilities CEO Jay Stowe, we’ll be working with a muni-owned network to bring our high speed service to Huntsville. Few places are better positioned than Huntsville to show what’s possible with top Internet speeds. The Rocket City boasts the highest concentration of engineers in the country, and ranks among the best places in the country for STEM workers. Ultrafast Internet will help enable Huntsville to remain at the forefront of science and tech. So what comes next? Pending final approvals, Huntsville Utilities will design and construct its network. Once the network is built, Google Fiber — or any other broadband provider — will be able to bring high speed Internet service to the city. This is just the beginning of the process, so it's too early to share dates or timelines. 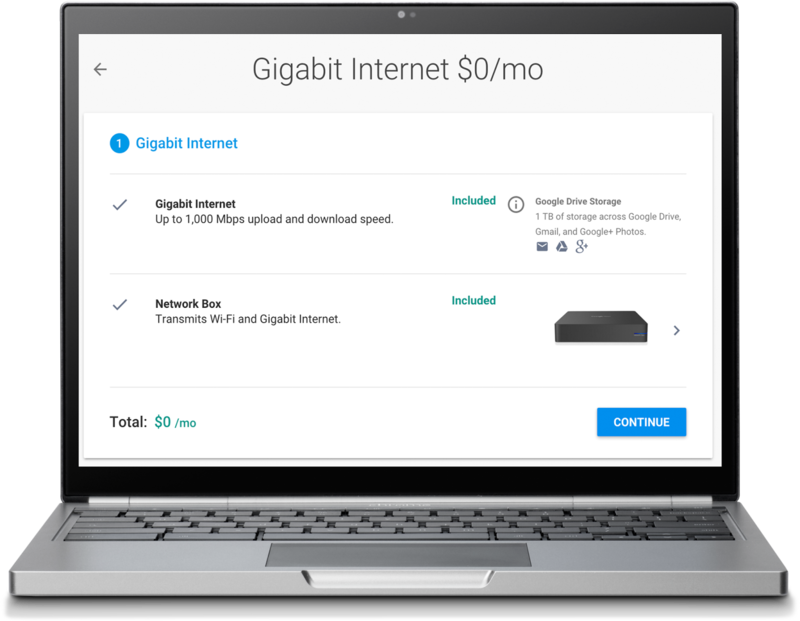 But, if you'd like to receive updates on when Google Fiber will come to Huntsville, sign up at google.com/fiber/cities/huntsville. This morning, we stood alongside Mayor Tommy Battle as he announced that we’re bringing Google Fiber to Huntsville, Alabama, using part of the fiber network that Huntsville Utilities is building. to serve public housing residents across our Fiber cities. These residents can use their superfast connection to finish homework, apply for jobs, or learn to code, all from home. West Bluff residents signing up for free gigabit Internet in Kansas City this week. With this program, we’re bringing the best service to the families that need it most. But roughly one-third of Americans, many of whom live outside public housing, still don’t have home broadband. That’s why we’re working with partners across our Fiber cities to meet the needs of those families, too—with programs like the Digital Inclusion Fellowship and the Kansas City Digital Inclusion Fund. We know there is no one-size-fits-all solution to closing America’s digital divide, so we’ll continue to tailor our work at the local level to address the unique needs of each community. More people should have access to fast Internet. This year, we're exploring new ways to make that happen. In addition to bringing free gigabit Internet to select public housing, we’ll introduce a new affordable Internet option in some cities—a low-cost broadband connection that’s fast enough to make video calls and stream HD content. And by offering upload speeds that match download speeds, people will have the opportunity to become web creators and truly make the most of being online. This plan will be available in the most digitally divided areas we serve, determined using publicly-available data from the U.S. Census, FCC, and other sources. People in these neighborhoods won’t need to fill out applications, apply for eligibility, or pay any construction or installation fee. For those who are looking for more speed (but aren’t quite ready for our Gigabit service), we’ll also trial a new faster option at a lower price across our Fiber cities. We’re also extending programs like Community Connections to all Fiber metros, providing free gigabit Internet to public places where people can access fast speeds outside the home, such as libraries, community centers, and nonprofits. Finally, we’re experimenting with different technical solutions to hook up residents in various neighborhoods who we previously couldn’t connect. We’ll share updates as those technologies are implemented. Though our approach may differ city to city, one thing remains consistent: this work is not possible, or effective, without working closely with partners to bring more people online. Huge gratitude to: ConnectHome, Secretary Julian Castro and HUD, EveryoneOn, US Ignite, Nonprofit Technology Enterprise Network, the Housing Authority of the City of Austin, the Housing Authority of Kansas City, and many more. It takes a village to connect a village, and we’re looking forward to even more great programs and partnerships to come. For the latest on our work, check out our new community impact website. This Wednesday, I watched families at the West Bluff public housing property sign up for home Internet service. It was a pivotal moment—many of these residents were coming online for the first time, and they were doing so with some of the fastest speeds available. West Bluff is just the first of many properties that will receive free gigabit Internet service through our commitment to serve public housing residents across our Fiber cities. These residents can use their superfast connection to finish homework, apply for jobs, or learn to code, all from home. with ConnectHome, an initiative by the U.S. Department of Housing and Urban Development (HUD) and the White House to accelerate Internet adoption by families with school-age children in public housing. Today, alongside HUD Secretary Julián Castro and local partners, we’re proud to take another step in that commitment by announcing that we’ll be bringing gigabit Internet service to residents in all public housing properties that we connect with Google Fiber. Families in these properties will be able to access some of the fastest speeds, at no cost to the housing authority or to residents. Affordable housing residents can sign up for service using a process that makes it easier to bring the Internet home. Working side-by-side with the Housing Authority of Kansas City, we’re launching the program today at West Bluff, the first property to receive gigabit Internet as a part of this program. We’ve wired all 100 homes with Fiber, and families can sign up today to access the Internet at up to 1,000 Mbps. And through local ConnectHome partners, such as Connecting for Good and Surplus Exchange, they’ll also be able to purchase discounted devices and learn new computer skills. Across Kansas City, we’re working with local affordable housing providers to connect up to nine properties, reaching more than 1,300 families in the metro area. A West Bluff resident and her son are among the first to receive gigabit Internet from Google Fiber at no cost. Looking forward, we plan to bring gigabit Internet to select affordable housing in all of our Fiber cities. We’re working with local providers to identify which properties we’ll connect across these markets, and we’ll have more to share as we bring Google Fiber to these cities. Finally, inspired by the early success of our work with the Housing Authority for the City of Austin, we’ll be complementing this $0/month Internet service by working with local partners to make new investments in computer labs and digital literacy classes so residents learn the skills they need to get online. The U.S. has some of the most expensive broadband in the world, while lagging far behind other countries in Internet speeds. And for families in affordable housing, cost can be one of the biggest barriers to getting online. Alongside our ConnectHome partners, we’re proud to make some of the fastest Internet more available and accessible to those who need it most. At Google Fiber, we often talk about how superfast speeds and access to home broadband can move entire communities forward. For low income families, access to the Internet can mean the difference between thriving or falling behind. It can mean more children using computers in after-school programs and STEM classes, more students going online to finish their homework, more people taking advantage of resources like Khan Academy, and more families learning basic computer skills that help them be more connected. That’s why last year, we partnered with ConnectHome, an initiative by the U.S. Department of Housing and Urban Development (HUD) and the White House to accelerate Internet adoption by families with school-age children in public housing. Today, alongside HUD Secretary Julián Castro and local partners, we’re proud to take another step in that commitment by announcing that we’ll be bringing gigabit Internet service to residents in all public housing properties that we connect with Google Fiber. Families in these properties will be able to access some of the fastest speeds, at no cost to the housing authority or to residents.